I felt a little inspired to create a review for a movie I saw yesterday in theatres. While it may not be the most widely recognized or talked about film hitting cinemas this week, it was one of the most strangely entertaining and campy films I've seen in a while. The movie is the big screen adaptation of the 1960's supernatural soap-opera: Dark Shadows. Fast forward to the 1970s, the Collins family has become a shell of its former self. Their mansion is falling apart, their shipping business is barely making ends meet, and the family is still plagued by the infamous curse cast centuries before. After an unfortunate discovery at a McDonald's construction site, Barnabas is freed from his tomb and discovers that things have changed since his time in confinement. He soon returns home to his manor and resumes the role as the patriarch of the Collins family. Remaining of his lineage is Elizabeth Collins Stoddard (Michelle Pfieffer), the head matriarch, Carolyn Stoddard (Chloe Grace Moretz), rebellious wild child daughter of Elizabeth, Roger Collins (Jonny Lee Miller), Elizabeth's irresponsible brother, and David Collins (Gulliver McGrath), Roger's bright-eyed son. Rounding out the main cast of the Collinswood Manor is Victoria Winters (Bella Heathcote), David's Governess and the reincarnation of Barnabas' lost love Josette du Pres, Willie Loomis (Jackie Earl Haley), the Collins' handyman, and Dr. Julia Hoffman (Helena Boneham Carter), the live-in psychiatrist. The Good: Dark Shadows has one major thing that will encompass the reason to watch this film: it was directed by Tim Burton. Tim Burton has a specific and unique directing style which you can notice in each of his films. It's dark, campy, and doesn't rely on the requirement of special effects or past references. Sure, this is a film adaptation of a former television show, but excluding that factor altogether, it could stand as its own movie. The acting was also a positive for Dark Shadows. Even though the film is primarily set in 1972, which is the time of free-love, disco and rock music, it's easy for any character (and by extension actor) to go really campy and silly in their role. Surprisingly, not many of the characters decided to take that route with their impersonations. 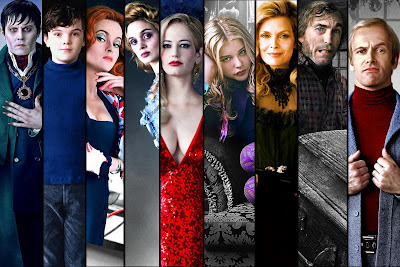 Standouts would have to be Chloe Moretz, Helena Boneham Carter, Michelle Pfieffer and Eva Green. Particularly Eva Green and Michelle Pfieffer the most. Green shined in her role as villainous Angelique and defined the part of a soap-opera villain brought to the big screen while Pfieffer always brings an essence of superiority to her matriarchal roles. The Bad: Nothing really stood out for Dark Shadows. Sure, it was a campy film about a television soap-opera from the 1960s but what else was there? There was no real presence or urgency to follow these characters throughout the film and hope for a satisfied conclusion. While the movie did have a dramatic and cinematic confrontation between Barnabas and Angelique, most of the film could have been classified as filler or scenes included from the series. One moment in particular which should have been developed further was the role of Dr. Julia Hoffman (Boneham Carter), it was a main role and she did play an important part but at times, it felt more like a cameo. The final point that some viewers could deem the deciding factor was Johnny Depp. 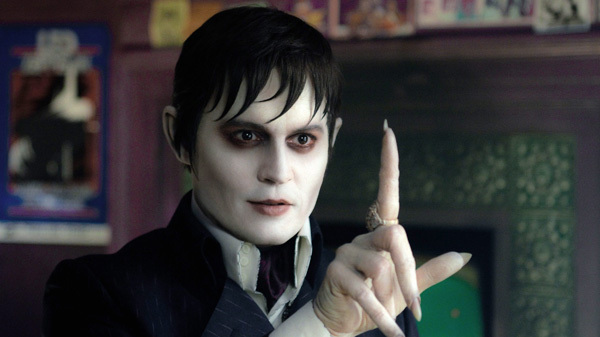 As if with tradition for any Tim Burton film, Johnny Depp plays the leading role as Barnabas Collins. His presence is the one that carries the story throughout, from the beginning of his family's demise to the conclusion at the end of movie. 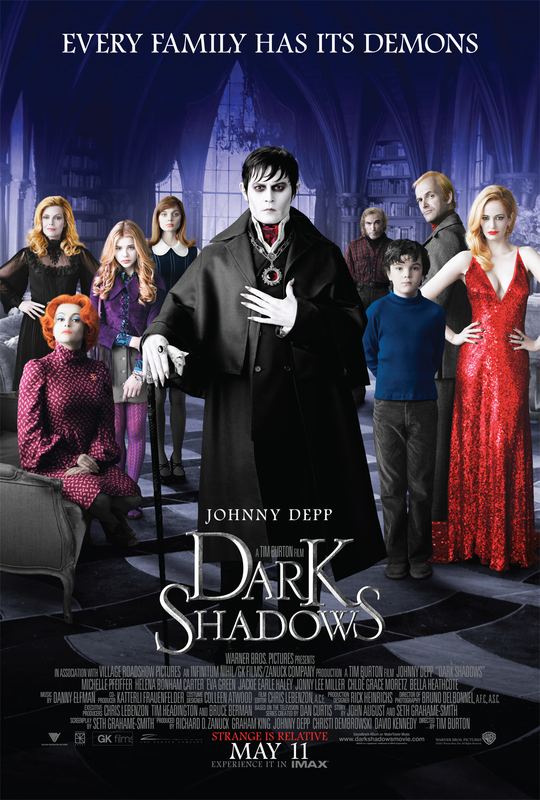 His performance in Dark Shadows was good, a little reminiscent of his previous work but it didn't standout overall. Barnabas Collins wouldn't be a role that many would classify as one of his best acting pieces. Don't get me wrong, I liked him in the role and he did do a good job but it wasn't an incredible performance. A bit harsh with the rating this time; it's probably the lowest I've ever given to one of my reviews. Before going to watch the movie, I'd never heard of Dark Shadows (the TV show) before or had any inclination to look it up. After seeing the film, I did take a couple of minutes to put some information together and discovered it was a TV show from the past. Overall, it was a good film and some of the actors stood out in their performances. Special effects were great, storyline was a tad dull at times and you will get a few good laughs. My recommendation is to watch the film if you're into Tim Burton and Johnny Depp movies, but don't go into it expecting groundbreaking or inspiring work. It's a popcorn movie and you'll most likely catch the film in the future when it airs months/years later. Agree or Disagree with the review? Leave your comments below and let us know what you thought about the film.